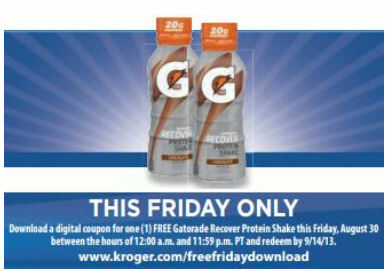 We have another great FREE Kroger Friday coming up this week and this time it’s an eCoupon for a FREE Gatorade Recover Protein Shake. To get your freebie, download your coupon on Friday, 8/30 and then redeem it at checkout sometime within the next two weeks! These coupons are a perfect way to stack a little extra savings and try out some fun new products too!